Namaste and Happy Harvest Moon in Aries! First, how are you doing? I hope you are taking a few minutes every day to be with your own breath. 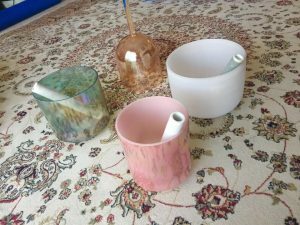 Please utilize this short video with my Alchemy crystal singing bowls to encourage this meditative process. They vibrate and connect us to the energy of the world’s ancient oceans, grandfather Sun, the wisdom of the women of the ages, mother’s love, and our high heart/Thymus. Tumultuous times call us to the present moment… it’s crucial in navigating the rough seas of the collective energy/physic debris. This energy craves to be transformed, and meditation does this very thing allowing us to act from a place that serves the higher good. This full moon in Aries summons the courage and vulnerability to go within and ask “how do I handle my own anger, aggression, rage, and how do my shadows come out every day with myself and others? It’s not an easy process… it’s easier to blame others for our anger, habits, and reactive nature, but ultimately WE are responsible for our own words and actions! At this time of great change in the world, we are being called to heal all the ways we contribute to the shadow every day in our small corners of the world. It’s in this vulnerability where growth comes from. We learn through knowledge, books, teachings, etc., but wisdom and growth come from embodying these knowings every day in the smallest of ways, especially when we are challenged by life throwing us out of our comfort zone… meditation, even a few minutes helps us in all these aspects. The changing of the season is a time to turn within and ask what is lighting your heart fire… not just what makes you happy, but what brings out your inner Kali? She aids us in standing up to injustice and untruths, in dismantling the old ways of the past. The theme for this entire year has been, as I’m sure you’ve noticed, about the lifting of the veils. Truths being revealed left and right, falsehoods being exposed for what they are, genuine authenticity rising to the occasion, and wounds coming up to be healed once and for all. And through this, we recognize who and what we are meant to be doing in the world. Your heart, your light, your compassion, your ACTION is being called forth as we speak. Here’s a little video about my online classes, which are so fun and we are all loving them! 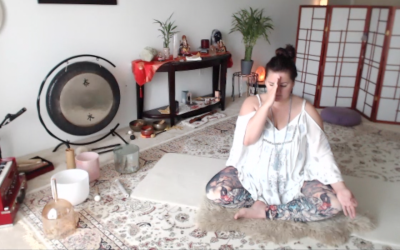 Here’s a little video clip from Wednesday’s morning yoga, Meditation for a Calm Heart. 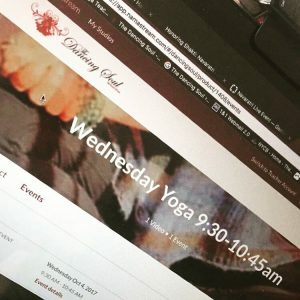 I record my yoga classes and you have unlimited access to the recording for one week! Lastly, I’ve joined the Kula Yoga family 🙏 and will be stepping up to help with our community Sadhana practice held twice a month at Kula Yoga Shala! Sat Kirtin Kaur and I will share the honor of leading these powerful gatherings. I’m up for this Saturday. You can find the info here on the FB event. Sadhana (spiritual practice) is like a vibrational express train to uplift your inner state which ripples into the entire world!